Russian sculptor; born in Wilna in 1842. As a young child he displayed a talent for art, and after a short term in the ḥeder (Hebrew school) applied himself to the study of carving in wood. Artistic carvings in wood executed by him attracted attention, and the youthful artist was presented to General Nazimov, then governor-general of Wilna. At the age of twenty-one he went to St. Petersburg, where, with the aid of Mme. Nazimov, he was enabled to enter the Imperial Academy of Fine Arts. While there he maintained himself by working in a turner's shop, receiving a very scanty compensation. In 1864 the silver medal of the first order was awarded to him by the academy for his wood-carving,"The Jewish Tailor," which promptly gained for him a reputation. In the following year "The Miser Counting His Money," a work executed in ivory, brought him the large silver medal of the academy and a pension from the emperor. In 1866-67 he produced a bas-relief, "The Judas Kiss," and a group modeled in clay entitled "The Descent of the Inquisition on a Jewish Family at the Feast of Passover." For certain reasons the academy would not elect him a member, but offered him the unusual title of honorary citizen, which he declined. 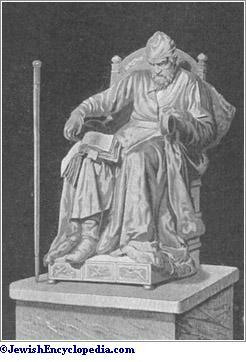 In 1868 Antokolski went to Berlin, and after a short stay returned to St. Petersburg, and produced the famous statue, "Ivan the Terrible," for which he was appointed an academician at the express command of Emperor Alexander II., who purchased the statue and ordered a bronze casting of it to be placed in the Hermitage at St. Petersburg. The statue represents the tyrannical czar in one of the intervals of remorse. Soon after the completion of this work Antokolski went to Rome, where he produced the colossal statue of "Peter the Great" (1872), and projected "Dmitri Donskoi," "Yaroslav the Wise," and "Ivan III." 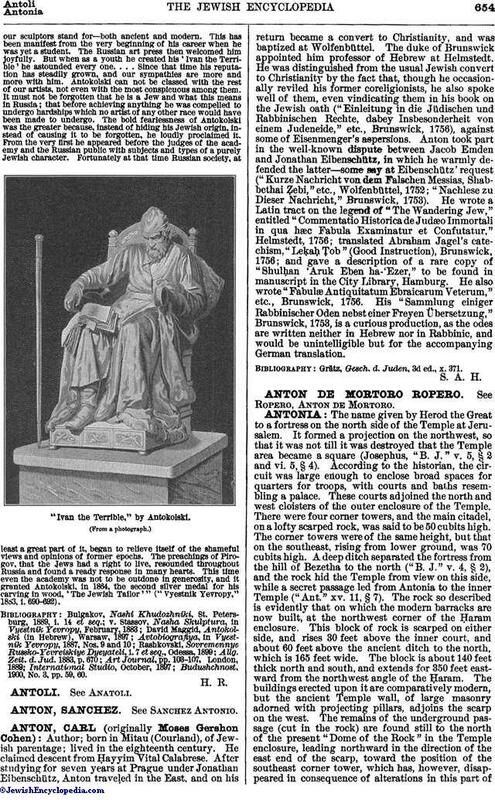 In his autobiography Antokolski speaks of the extraordinary popularity that "Ivan the Terrible" had among his countrymen, whereas his statue of Peter the Great was not appreciated in Russia till after its successful exhibition at the Paris Salon. According to his opinion the half-mythical Ivan speaks more feelingly to the national heart than the epochmaking and energetic Peter. Bust of "Mephistopheles," by Antokolski. In 1874 Antokolski produced "Christ Bound Before the People," which was received with great enthusiasm. In 1875 he returned to St. Petersburg, and while there produced in quick succession "The Death of Socrates" (1876), "The Last Sigh" (1877), and "The Head of John the Baptist" (1878). In the same year his works were exhibited at the Paris Exposition, when the jury awarded him a first-class medal. He was also created by the French government Knight of the Legion of Honor. In 1880 he received the title of professor of sculpture and settled permanently in Paris. In 1882 he produced "Spinoza," and later "Yermak" (the Cossack conqueror of Siberia) and "Nestor, the Annalist." At the Paris Exposition of 1900 he exhibited "The Sleeping Beauty" and "Pax," the latter a young blind Christian girl in front of the Coliseum. "Death of Socrates," by Antokolski. 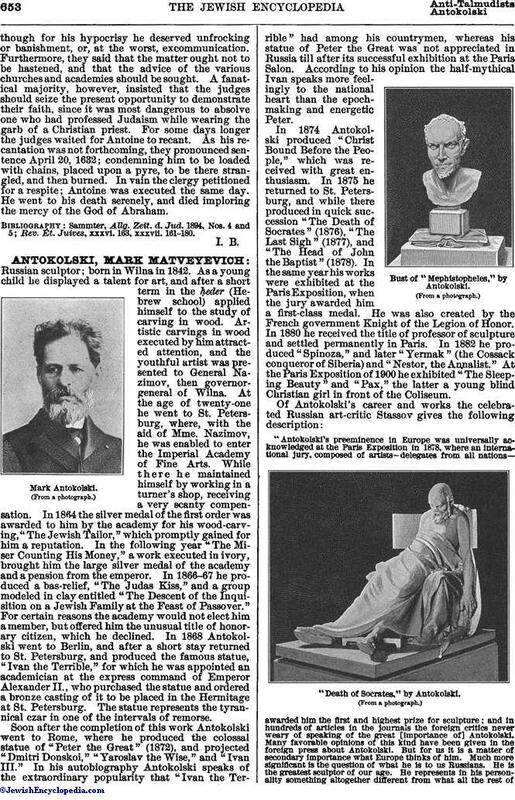 "Antokolski's preeminence in Europe was universally acknowledged at the Paris Exposition in 1878, where an international jury, composed of artists—delegates from all nations—awarded him the first and highest prize for sculpture; and in hundreds of articles in the journals the foreign critics never weary of speaking of the great [importance of] Antokolski. Many favorable opinions of this kind have been given in the foreign press about Antokolski. But for us it is a matter of secondary importance what Europe thinks of him. Much more significant is the question of what he is to us Russians. He is the greatest sculptor of our age. He represents in his personality something altogether different from what all the rest ofour sculptors stand for—both ancient and modern. This has been manifest from the very beginning of his career when he was yet a student. The Russian art press then welcomed him joyfully. But when as a youth he created his 'Ivan the Terrible' he astounded every one. . . . Since that time his reputation has steadily grown, and our sympathies are more and more with him. Antokolski can not be classed with the rest of our artists, not even with the most conspicuous among them. It must not be forgotten that he is a Jew and what this means in Russia; that before achieving anything he was compelled to undergo hardships which no artist of any other race would have been made to undergo. The bold fearlessness of Antokolski was the greater because, instead of hiding his Jewish origin, instead of causing it to be forgotten, he loudly proclaimed it. From the very first he appeared before the judges of the academy and the Russian public with subjects and types of a purely Jewish character. Fortunately at that time Russian society, at least a great part of it, began to relieve itself of the shameful views and opinions of former epochs. The preachings of Pirogov, that the Jews had a right to live, resounded throughout Russia and found a ready response in many hearts. 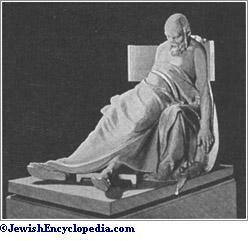 This time even the academy was not to be outdone in generosity, and it granted Antokolski, in 1864, the second silver medal for his carving in wood, 'The Jewish Tailor'" ("Vyestnik Yevropy," 1883, i. 690-692). "Ivan the Terrible," by Antokolski. Budushchnost, 1900, No. 3, pp. 59, 60.